...complete with FREE INSTALLATION INSTRUCTIONS FOR JUST $19.98 each!! **PLEASE NOTE: These Mercury Capri Quarter Cable End Retainer Swivels / Pivots are PRICED INDIVIDUALLY, BUT SOLD ONLY AS A SET. Therefore, the amount shown on your invoice will be two times (2) x 21.98 or JUST $43.96 per set!! Now you can replace your original, broken, and or missing, Mercury Capri, obsolete and weak, "pot" metal or plastic, cable swivel/pivot retainers which a WHOLE NEW DESIGN! To this end, Modern Capri Parts designed this brand new CUSTOM MADE, CNC Machined Billet Aluminium Mercury Capri convertible top quarter cable Quarter Cable Tension Retainer / Swivel / Pivot to work on both the RH and/or LH side of your top frame and far stronger as compared to the INFERIOR, poor quality, reproductions offered elsewhere. This small Mercury Capri cable retaining swivel / "Pivot" secures the lower quarter soft top cable to the convertible top frame and allows tension adjustment using a small specialized nut. Instead of being made of "pot metal or plastic as were the originals and reproductions which frequently break, Modern Capri Parts designed this brand new CUSTOM MADE Mercury Capri convertible top quarter cable Tension / retainer / swivel / Pivot of CNC Machined Billet Aluminium. To boot now you can NOW purchase just one to interchangeably fit EITHER THE RH/ Passenger's Side OR LH/Driver's Side. 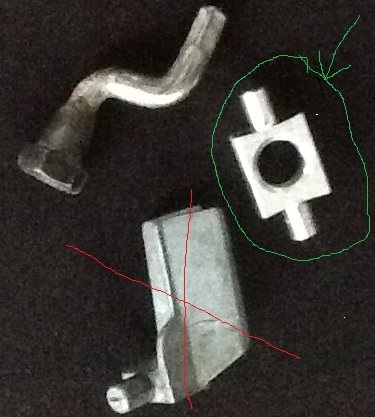 See second PIC to compare designs of the original V.S. our newly designed ear top, rear, quarter cable end / retainer / swivel / Pivots. In summary, the original, and later reproduction, Mercury Capri Quarter Cable End Retainer Swivel / Pivots, were made of "pot" metal for the 1991, 1992, and 1993 Mercury Capri model years of black plastic for the 1994 Mercury Capri model year only. In addition, the ORIGINAL Mercury Capri Quarter Cable Tension Retainers / Swivels / pivots are NOT interchangable RH to LH , so you'd have to buy a set even if you needed one. In addition, the reproductions, if offered elsewhere, typically more expensive than the price of these newly designed quarter cable Tension retainers / swivels / Pivots as compared to the weak reproduction Mercury Capri Quarter Cable Tension Retainer Swivel / Pivots. Please use the drop-down menu below to select if you want just ONE (1) Mercury Capri Quarter Cable Tension Retainer Swivel / Pivot or TWO (A SET). The shopping cart will automatically adjust the price of one Mercury Capri Quarter Cable Tension Retainer Swivel / Pivot / Capri Quarter Cable Tension Retainer Swivel/ Pivot making a set just $43.96. Application: All mercury capri models including the XR2 convertible: 1991, 1992, 1993, 1994 - Mercury Capri quarter cable soft top retaining swivel / Pivot: 1991 / 91 Mercury Capri Convertible Top Quarter Cable Tension Retainer Swivel / Pivot 1992 / 92 Mercury Capri Convertible Top Rear Quarter Cable End Retainer / Swivel / Pivot, 1993 / 93 Mercury Capri Convertible Top Cable Tension Retainer / Swivel / Pivot 1994 / 94 Mercury Capri Convertible Quarter Cable Tension Retainers / Swivels / Pivots.